Adam Diggs, a finance/accounting major from Knoxville, Tenn., was named the 2019 Outstanding Senior at Maryville College during the Academic Awards Ceremony.... Read More. A representative from Perform International Tours will present an information session on the 2020 Companion Tour to England and Scotland. ... Read More. Katelyn Moats ’19, a biochemistry major from Maryville, Tenn., was presented the distinguished LeQuire Award during Maryville College’s Academic Awards Ceremony held April 6, 2019.... Read More. The Maryville College Community Chorus and the Orchestra at Maryville College will present a “Bicentennial Concert” on Tues., April 23, 2019.... Read More. The Maryville College Theatre Department will present “Our Stories on Stage” and “An Evening of Improv!” April 22-23, 2019 at the Clayton Center for the Arts.... Read More. Andi Morrow ’09 wrote, produced, directed and stars in "Pusher," a short film about the impacts of opioid addiction in Appalachia. The film made its world premiere last month at the Pasadena International Film Festival.... Read More. More than 50 students, faculty, staff and student organizations were honored for outstanding campus and community leadership during the annual Leadership Awards Ceremony on April 8, 2019.... Read More. Maryville College’s annual Easter Sunrise Service will be held Sun., April 21, 2019 at 6:30 a.m. on Lloyd Beach. The service is open to the community.... Read More. 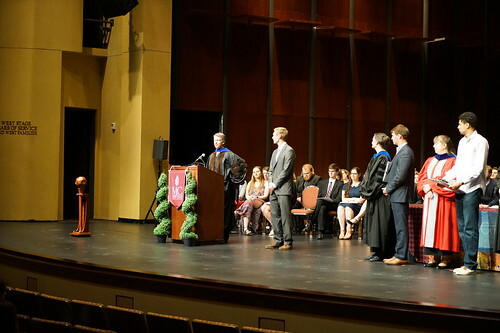 Scholarship and the ideals of the liberal arts were celebrated April 6, 2019, when 61 awards were presented to 72 students at Maryville College’s annual Academic Awards Ceremony.... Read More. This spring, Dr. Aaron Astor, associate professor of history at MC, is teaching History 149: History of Maryville College.... Read More. The work of 16 Maryville College senior art majors will be on display April 8 through May 4 at the Clayton Center for the Arts, as part of the spring 2019 senior art show.... Read More.